Pest description and crop damage Adult lygus bugs are oval-shaped, about 4 mm long with a light yellow 'V' on the back. 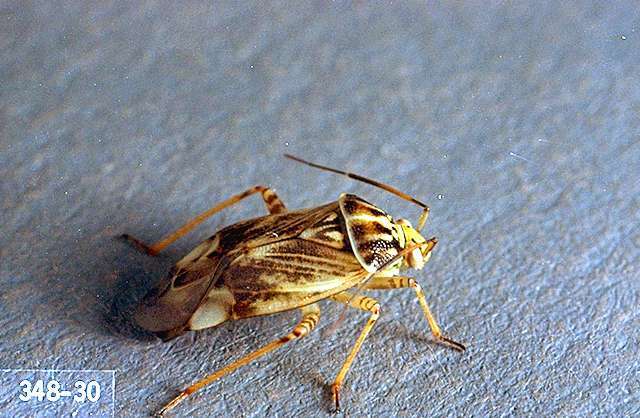 These bugs feed on developing leaves, flowers and fruit, which kills the tissue around the feeding site. Lygus bugs can be a contaminant in mechanically harvested berries. Biology and life history The insect overwinters as an adult in protected areas such as organic debris piles, in bark cracks, etc. Adults become active in early spring, feeding on buds of trees and shrubs before moving to other plants. 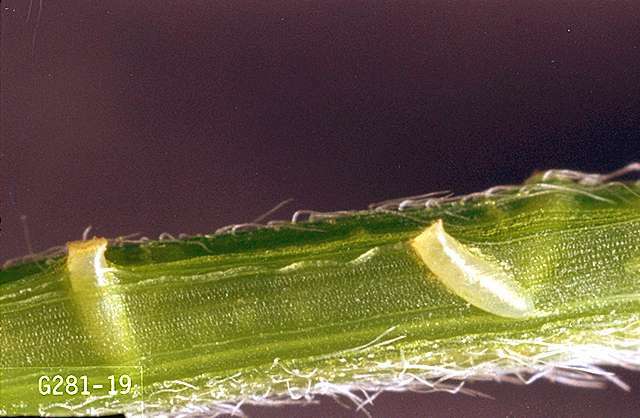 Eggs are laid in the stems and other tissues of host plants. 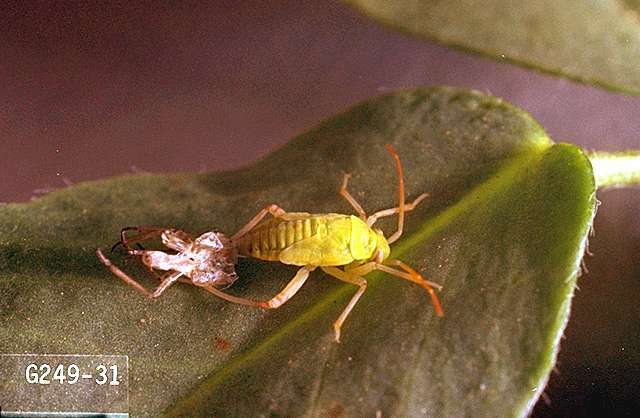 After the nymphs hatch, they begin feeding on plant tissue. There may be several generations per year. Eliminate weeds that serve as protection and early season food for the insect. Adults display considerable resistance to pesticides; chemical sprays should be directed at controlling the nymphs. fenpropathrin (Danitol) at 0.2 to 0.3 lb ai/a. PHI 3 days. Do not exceed two applications per season. Restricted use pesticide. malathion (several brands) at 1.75 to 2 lb ai/a. PHI 1 day. Thorough coverage is important. thiamethoxam (Actara) at 0.047 lb ai/a. PHI 3 days. Do not apply during bloom or when bees are foraging in the area. Note "Bee Advisory Box" and restrictions on the label.